Directions: From Anacortes, drive south out of town on H Avenue, which becomes Heart Lake Road. Park in lot at the base of Mt. Erie or in parking spaces on the east shoulder of Heart Lake Road. Walk west across Heart Lake Road to #212 trailhead. 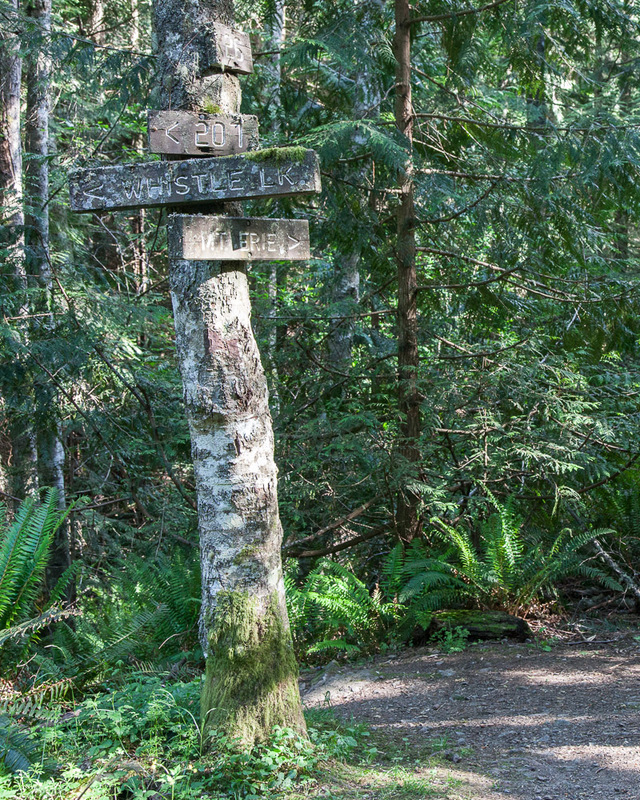 Take the first right to follow this loop trail counterclockwise - warming up on the flat trail, then climbing a moderate hill mid-trail and enjoying a mild downhill walk at the end. About .25 miles before the returning to the trailhead, watch for spur trail #213 on your left - it can no longer boast a clear view of Puget Sound, but it has a good grassy spot for a rest or picnic. If you start left, you'll follow #25 uphill for .25 miles before it becomes #212. You'll descend the big hill mid-hike, then climb back up slightly to the junction with trail #210. If you have the time, take #210 for .25-.5 miles to the shoreline of Heart Lake. Directions: From Anacortes, drive south out of town on H Avenue, which becomes Heart Lake Road. Park on the shoulder on the right, just before the “twin trees” (photo below left). From Hwy. 20, turn west on Lake Campbell Road, then right at the Lake Erie Grocery. Park on the west shoulder immediately after the twin trees. The center photo above shows the steep right loop start. The left loop starts gently, but quickly changes to a fairly steep descent to a valley and a bridge over a spring that’s graced with short falls in rainy seasons. Hike steeply uphill out of that valley and close to the top, watch for a left junction that leads through a madrona grove to a wildflower meadow (in spring) and big views of Mount Erie. 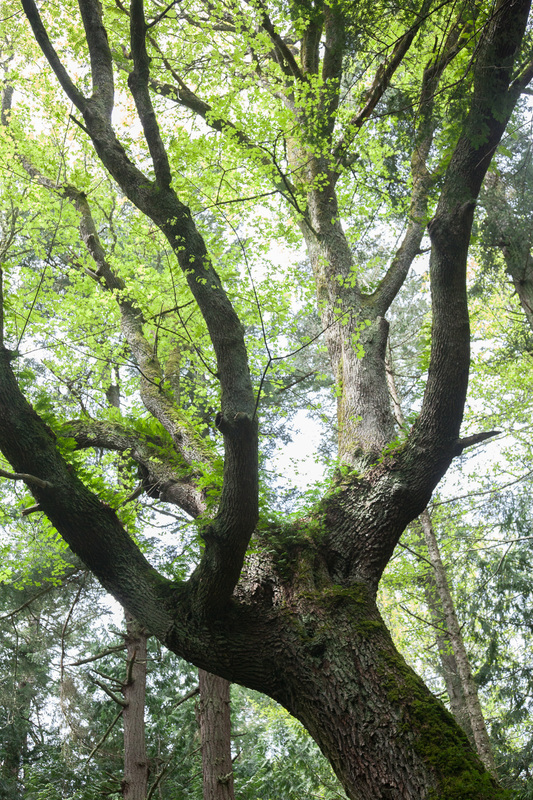 Since it’s about halfway through the hike, it could be a great place for a stop, or even a picnic. 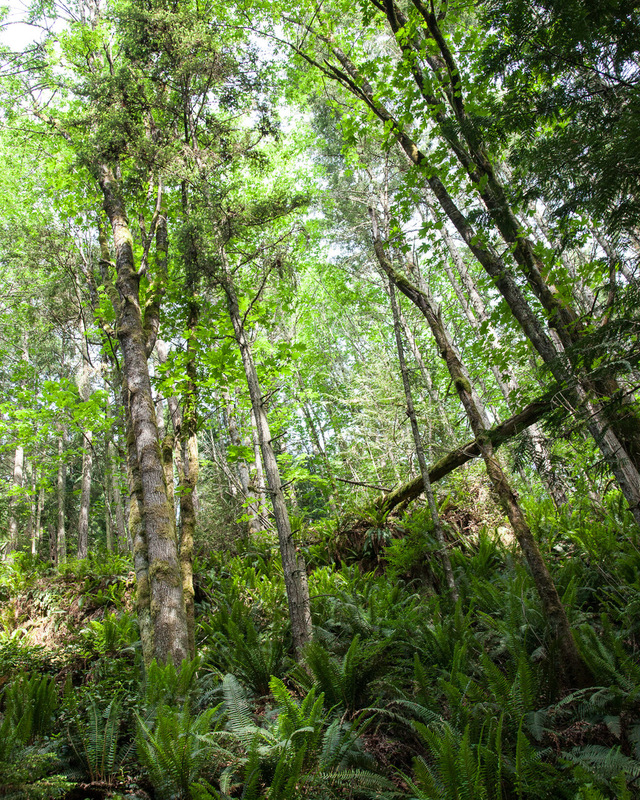 When you return to the trail, watch for a large big leaf maple on your left and marvel at its crop of ferns growing up the trunk and limbs (photo below left). Continue through slight ups and downs past a marshy area with bright yellow skunk cabbage blooms in early spring. 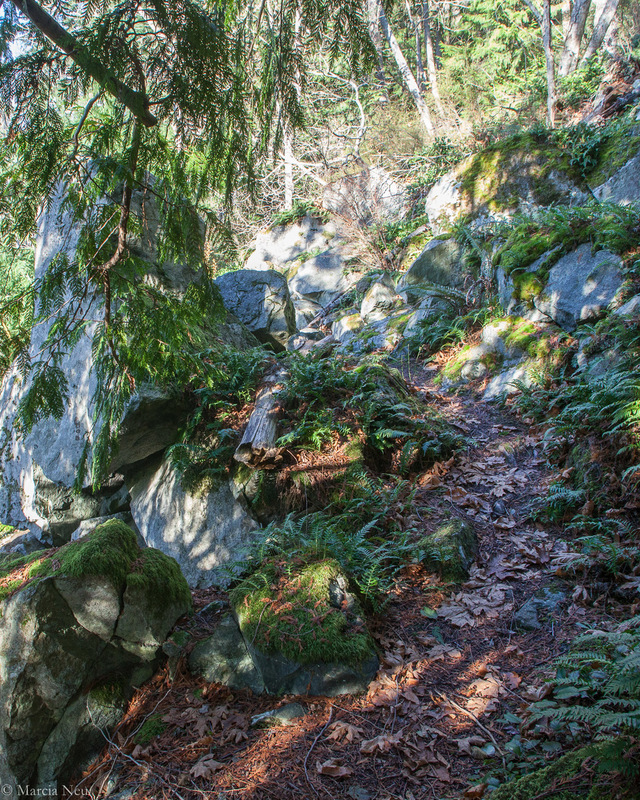 The trail finishes with a short, steep descent – take it slow and watch your footing on the loose rock! Taking the right loop route is best when it's wet due to the quick steep scramble that could be slick coming down if you started with the left loop. After this initial ascent, the trail flattens out for the first 15 minutes. When you reach the junction (see left loop description), go straight instead of turning left to enjoy head-on Mt. Erie views and the madrona grove. Overall, the trail is the reverse of above, with a footbridge over a creek with small waterfalls in spring (above center), then a long steep hill ascending out of the valley, ending in rolling short hills. Start at lower Access point for south Heart Lake trailhead. 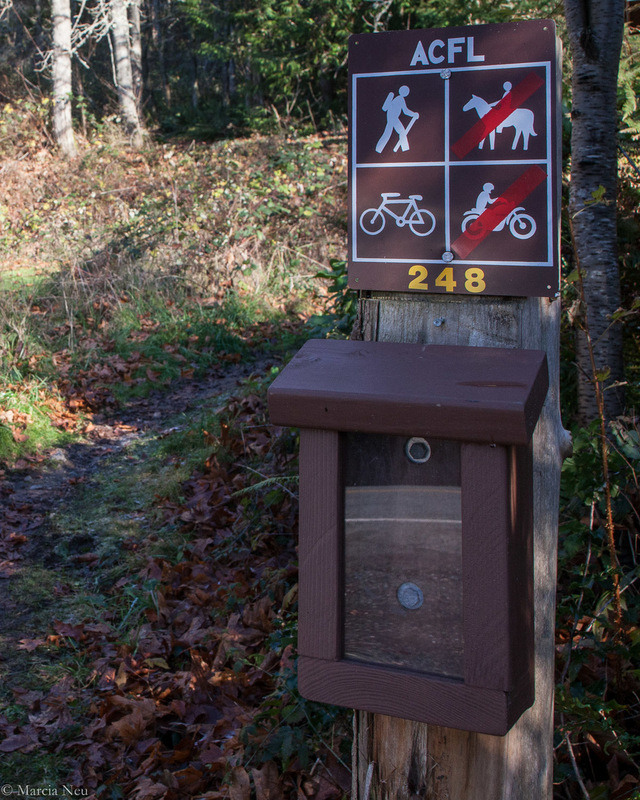 Turn right at the first junction and follow trail #212 for ¼ mile to the #210 trailhead on the right. 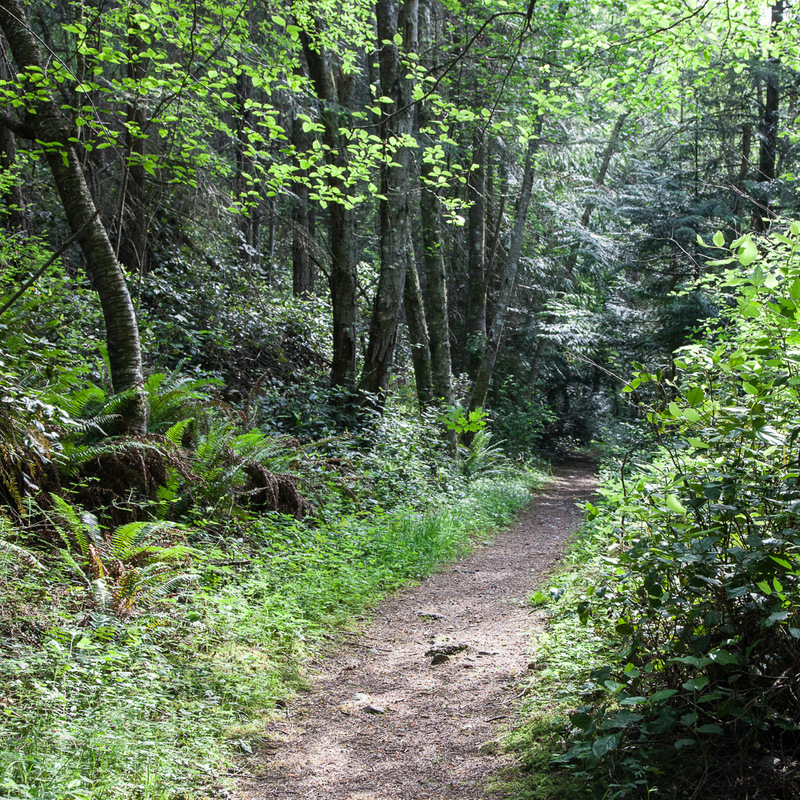 The first “big” hill down will be one of only 2-3 relatively easy hills on the trail – the south side of #210 is a gently rolling trail with limited traffic, so perfect for a lazy day hike. You’ll enjoy partial to full views of Heart Lake along the way – take one of the very short connectors to the shoreline if you want a full lake view. 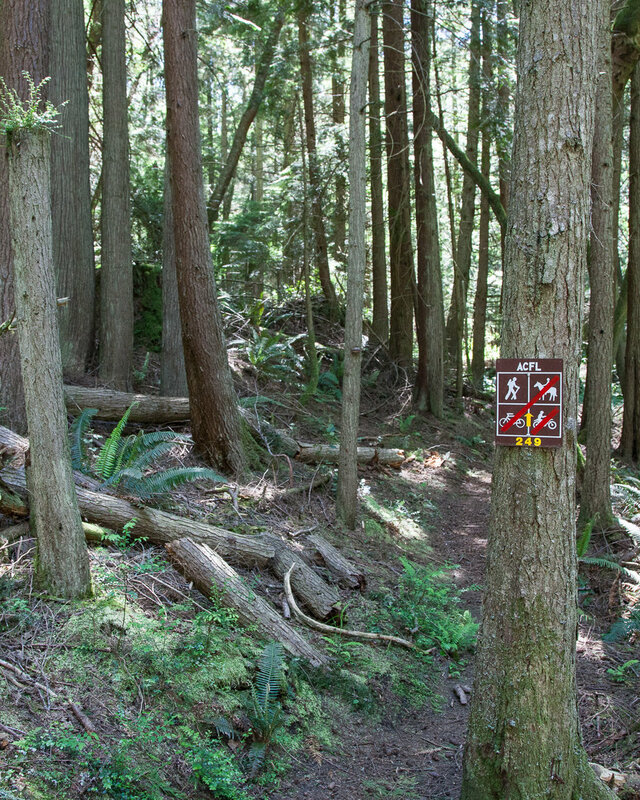 Some of the oldest Douglas firs, cedars and big leaf maples in the forestlands line this trail. 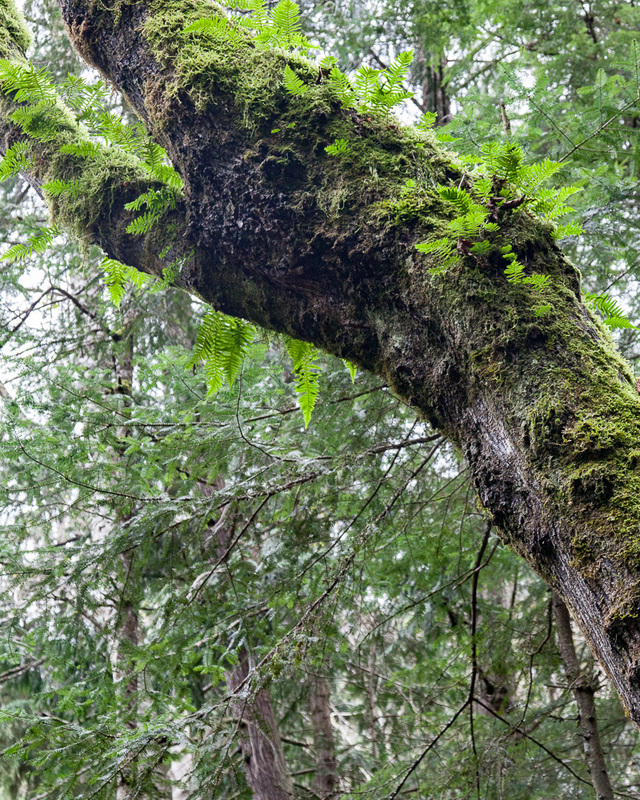 With a fairly dense forest canopy for most of the trail, this makes a perfect misty day hike. Directions: Follow signs to Mt. Erie and drive 1.4 mi. up the Mt. Erie Road until you see this sign on the left. If the three trailhead parking spots are taken, use the shoulder just ahead on the right. After .4 mi. turn right at the broad path that’s #21 and follow it for .25 mi. to #204 that skirts the north side of the lake. As you walk along the lake, you can take various short trails on the right to get better lake views (or even get in for a swim if it’s warm enough). The mileage above is based on turning around at first view of the lake – if you hike the entire lake loop on #204, then #205 (south side) and use #22 to connect back to #21, it adds 2.4 mi. to your overall hike. View from north side of Whistle Lake, the most popular swimming lake on Fidalgo Island. .5 miles roundtrip (400-ft. elevation rise) / 10 min. Directions: From Anacortes, drive south out of town on H Avenue, which becomes Heart Lake Road. Trailhead parking is on the left ½ mile south of the “twin trees” (see photo below left). From Hwy. 20, turn west on Lake Campbell Road, then right at the Lake Erie Grocery. The trailhead is almost immediately on the right, just after the white fenced yard. There are many rewards for this immediate expenditure of energy: access to the #247 trails that provide views of Lake Erie, Mt. Erie and many big leaf maples and Pacific madrones, rock falls and old cedars. 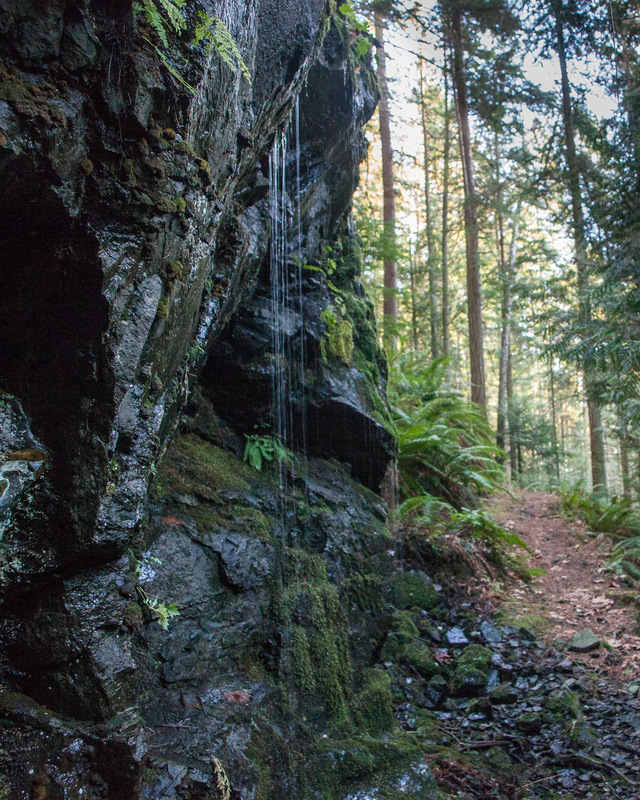 Known as the climbers’ trail, #248 and its connecting #247 trail(s) indeed serve as the springboard for those climbing the face of Mt. Erie. 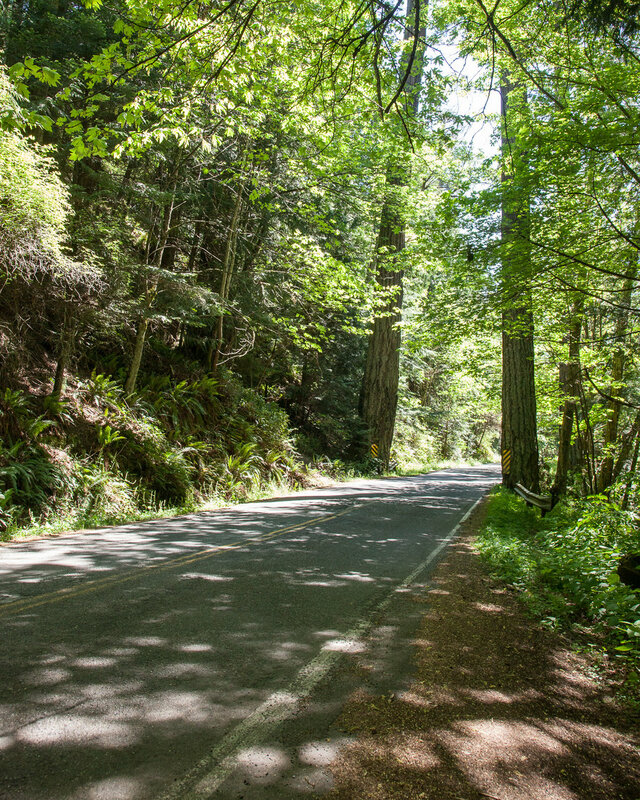 At the end of the steep initial climb, pause to catch your breath and to decide whether you’ll choose the left fork (see northbound #247) or right fork (see south & eastbound #247). Both offer lake views and pleasantly challenging ups and downs, so either one is a winning choice. 1.5 miles roundtrip / 40 min. Directions: See #248 which connects to #247. Within 20 minutes you’re here, overlooking Lake Campbell and its evergreen-forested mid-lake island. The trail runs all the way to Whistle Lake, but that’s a project for another longer hiking day. Directions: See above for #248 that connects with #247. Turn left off #248 for a mostly sunny hike that rewards immediately with a view of Lake Erie and the San Juans beyond. There are plenty of ups and downs to keep this trail interesting. But most interesting are features like the “sculpture garden” mid-trail comprised of a tumble of large rocks. if you’re lucky, a little further on, you’ll see someone learning to climb along a 30-foot rockface of Erie, close at hand. 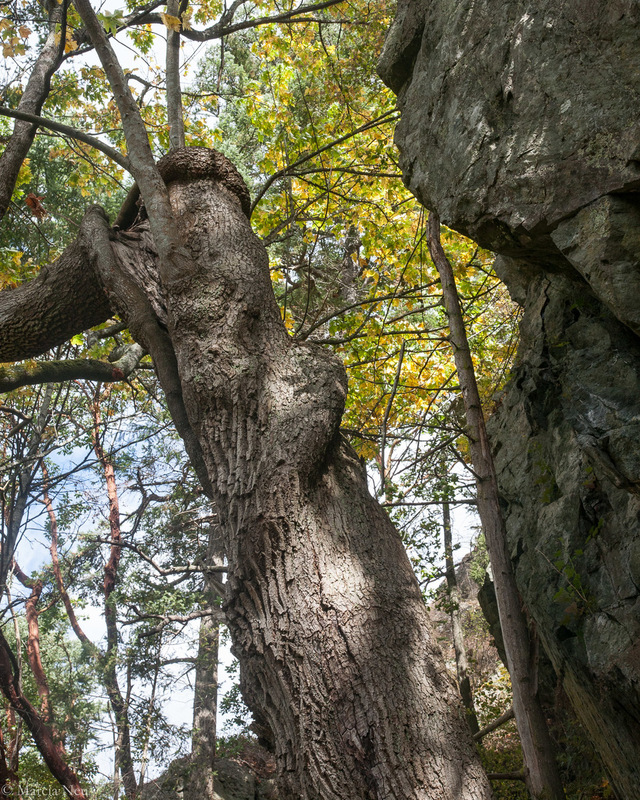 Even further along, after pushing up a minor hill, an old big leaf maple has stretched and bent along its neighboring rock wall. It’s especially striking at spring or fall when the leaves are glowing with color. 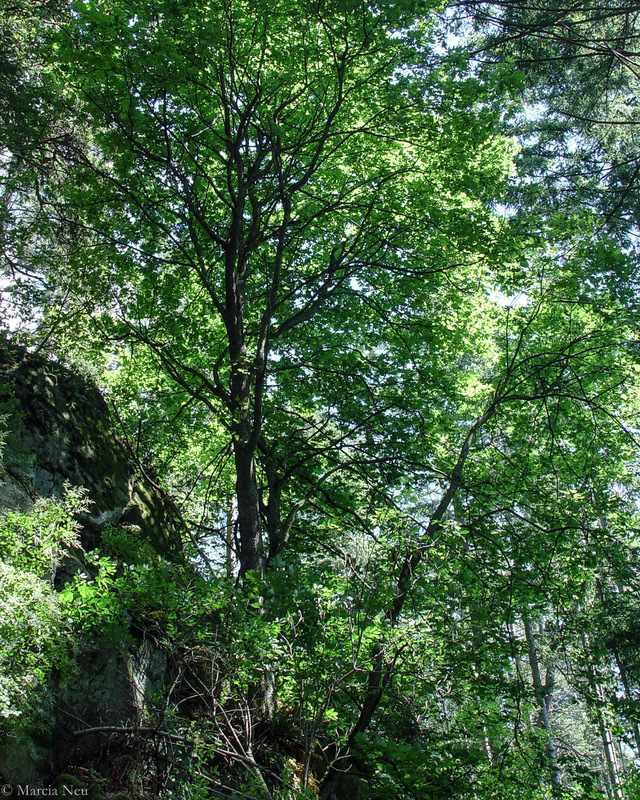 As you walk, keep glancing up to the madronas perched on the cliff face or even catch a glimpse of a climber mid-climb. All along the trail, pay attention to where you place your feet, especially in fall when the trail is buried in dinner plate-sized maple leaves. This trail is rocky and could be an ankle-turner if you’re not watching. But it’s virtually never muddy, which is great for November days when it’s been raining mercilessly and you want to grab more sunshine than can penetrate deep into most of the Forestlands trails. If you do the full roundtrip of the northbound trail, you’ll have deserved a rest on the bench that overlooks Lake Erie. A stand of madronas balances out the view of overhead power lines that stretch across the lake. 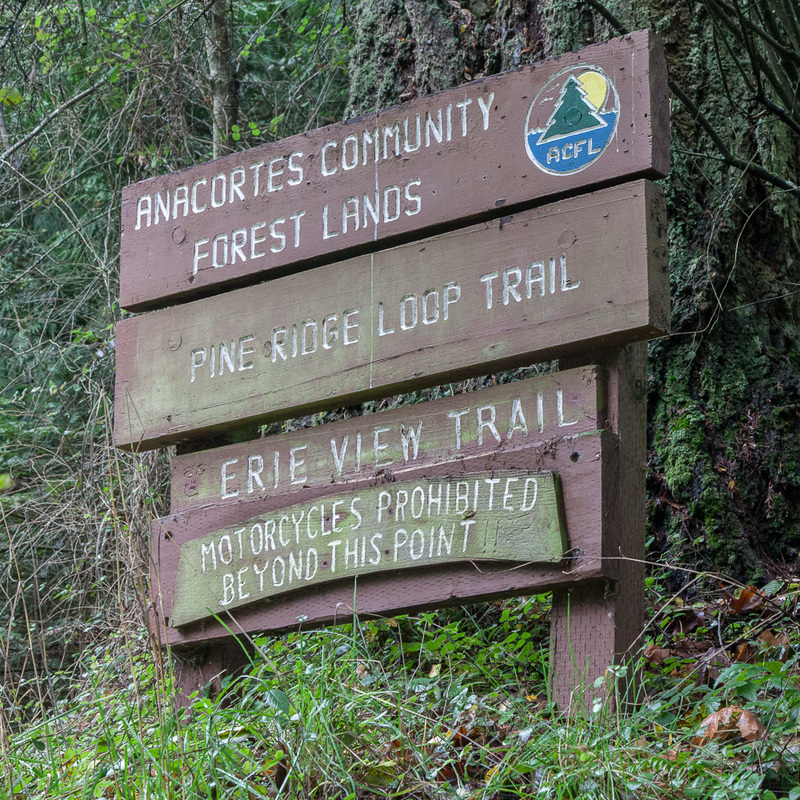 Directions: From Anacortes, drive south out of town on H Avenue, which becomes Heart Lake Road. From Hwy. 20, turn west on Lake Campbell Road, then right at the Lake Erie Grocery. Park on the west shoulder of Heart Lake Road just north of the “twin trees” (1/2 mi. north of the Lake Erie Grocery), then walk across the road to the trail adjacent to the east tree. This hike is even a good one in the snow, once you know the trail. If you don’t know it, it could be dangerous, as the trail is narrow and a bit tricky in places. I’ve done it once in snow and it was beautiful – snow covering rock slides and madrone trees, ferns laced with white. If the snow blows in from the west, the mountain takes a direct hit and you’ll see more snow here than on other Forestlands trails where the heavy canopy of cedars and firs protect the trails.